We checked claudication distance using a questionnaire, and we gauged low back pain when standing, referred pain, and radiating pain using visual analog scale scores. 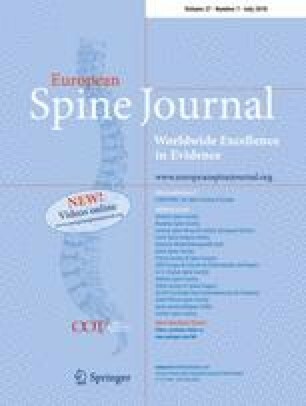 Three observers measured the CSA of the dural sac and SedSign, and normal nerve root sedimentation was classified as negative (N) and the absence of nerve root sedimentation was positive (P). P was sub-classified as positive with room [P(+); empty space apparent in the dura] or positive without room [P(−); no empty space in the dura]. SedSign reflected ongoing sedimentation inside the spinal canal of the nerve roots. We demonstrated negative sedimentation for the nerve root except for exiting nerve roots that settled into more than half of the dorsal region of the spinal canal and positive sedimentation as compressed nerve roots or as distribution of nerve roots that conglomerated from the ventral to the dorsal part of the equator as nerve roots. We evaluated functional outcomes using the Oswestry Disability Index and Roland–Morris Disability Questionnaire. One-way ANOVAs, Chi square tests, and correlation analyses evaluated the correlation CSAs and SedSigns. The total CSAs for the 716 sites were 98.63 ± 34.38 for N, 76.78 ± 28.78 for P(+), and 55.43 ± 27.77 for P(−), which were all statistically significant (p = 0.01). The correlations between pain and SedSign were not statistically significant (p > 0.05). There was no statistical significance in the correlations between the distance of the claudication and the CSA of the dura sac and the SedSign and between the functional score and the SedSign (both p > 0.05).